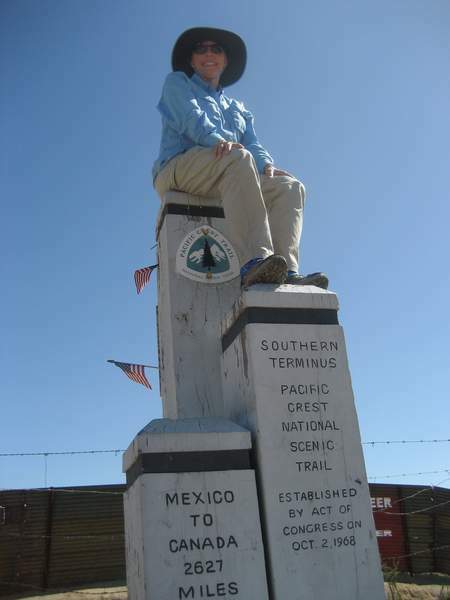 After years of preparation, I got to see Sandy, my “One,” take her stand on the border monument of the PCT followed by her first steps on her journey. So, why is she going and not me, you ask? This is a complex query. But I’ll try to keep it simple. Sandy teaches high school biology and her student always do extremely well on the Advanced Placement biology test. The test is May 12 and Sandy feels she has to teach until Wednesday, May 2 for them to be as prepared as they should be. But I do not want to be too far behind everyone else. So, Sandy is hiking 35 miles over the weekend, I will leave by myself on Monday, she will teach three more days and then she'll pick up the hike Wednesday after school and catch me at Mt. Laguna. Then we'll walk 2,600 miles together. Two years ago, when the year of the PCT hike became settled, I did the math. If you subtract 1977 from 2007, you get 30. On June 19, 2007, Sandy and I will have been thirty years married. Somewhere around the same time, the germ of an idea for a custom ring began. Sandy is not a jewelry person, but I wanted to do something special. I would have a PCT ring made. Last September, on the web, I found a jeweler whose pictured work showed my pipedream visions were at least possible. Miche of Eugene, Oregon, and I have never met, but we have poured hours into planning, revising, and going back to the drawing board, all to lead to Sandy’s ring. I know I stretched her skills, and may have stretched her patience. In conflict-free platinum and gold, with the PCT symbol prominently in the center, there is a channel in which is found etched in bas-relief, the Campo border monument, Mt. Shasta, Mt. Hood, and finally, Monument 78 at the Canadian border. 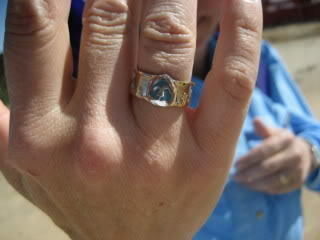 The completed ring came six weeks ago. It has been burning a white-hot hole in my pocket ever since. I was going to give it to her on our anniversary. But six weeks is enough! I gave it to her today, her first day on the trail. 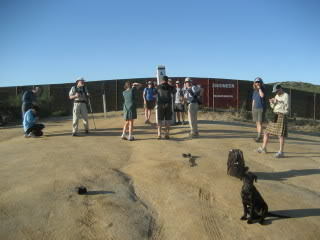 Yes, tears were shed at the border monument today. Thanks, Miche for your skills, my son Sean for the drawings, and Dina for being a steadying sea anchor when my ideas seemed to whirl out of control. Sandy loved it. Sandy:It is amazing and humbling to know that my husband of nearly 30 years loves me so much that he had a beautiful ring made for me that is absolutely one-of-a-kind – I’m fairly certain that no one has even conceived of such a ring. It’s really cool. On the trail: I set out at 3:30, a little behind Tumbleweed (great trail name). We leapfrogged a bit, then fell in together for a while. It was very warm, but the trail was pleasant, with a surprising (given the lack of rain) number of wildflowers – some I knew, some I want to look up when I’m home for a couple days. I didn’t stop much because I wanted to get at least halfway to Lake Morena before dark. We chugged along at a reasonable pace. Tumbleweed stopped at a small campsite at 7:30; I for some reason had confidence that I would find something another 15 minutes ahead, and I did. I stealth camped a bit above the trail in a sandy spot barely visible through the shrubs. First time I have solo camped on a backpack trip – it was good to feel comfortable doing so. I had two pieces of pizza for dinner, and finished the last of a two-liter platypus of water; I had drunk more than I expected hiking in the heat. Good to know. I didn’t even wait for hiker midnight (~9:00 PM) to go to bed, and I was asleep almost immediately.